We manufacture and supply a wide range of Underground Storage Tank, which is fabricated from superior quality of raw materials. The product is appreciated for its durability, comfort, reliability and specific features like optimum performance, latest technology and compact design. 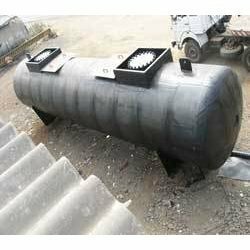 These chemical jacket type tanks are available with outer side bituminous coatings with length: 10.5Mtrs and Diameter: 2.25Mtrs. We manufacture and supply a wide range of Underground Storage Tank, which is fabricated from superior quality of raw materials. The product is appreciated for its durability, comfort, reliability and specific features like optimum performance, latest technology and compact design. These chemical jacket type tanks are available with outer side bituminious coatings with length: 10.5Mtrs and Diameter: 2.25Mtrs.